The malleable cast iron flange bush is required for the use of grinding and polishing tools on a grinding and polishing machine with conical shaft. It makes it possible to change the tools used (contact wheels, polishing rings, felt wheels, flap wheels, etc.) on the grinding and polishing machine extremely quickly. Tools equipped with a malleable cast flange bushing are simply pushed onto the conical shaft and possibly aligned with a soft hammer made of plastic or copper. The soft hammer must also be used for dismantling in order to remove the tools from the conical shaft with simple and light blows. Too hard blows can damage the malleable cast iron flange bushing. In most cases, the malleable cast iron flange bushing is mounted on a motor shaft located to the right of the motor. However, since there are also grinding and polishing machines where the motor shaft is on the left, a malleable cast iron flange bushing with a left-hand thread must be used here. To tighten the nut of a malleable cast iron flange bushing you need an 85 mm open-end wrench or a corresponding pipe wrench. The web width of the tools to be clamped must be at least 10 mm. Otherwise, an additional side window must be used. The normal malleable cast iron flange bushings can only be used up to a maximum clamping width of 75-80 mm (approx. 110 mm wide). If a larger clamping width is required, the flange bushings can be used up to a clamping width of 120 mm (approx. 150 mm wide). There are four different flange books, so there are also four different positions on the conical shaft. 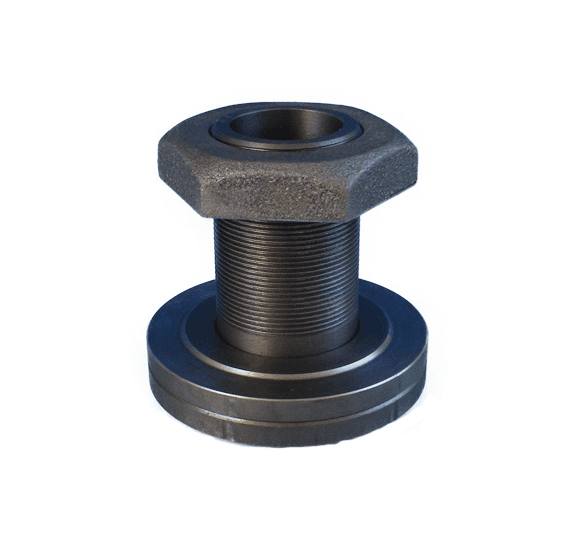 Cast iron flange bushings FAPI-CONNECT are available with either left-hand or right-hand thread.